Our first week sailing in Croatia was coming to an end. We’d motored into the Agana Marina that afternoon and just returned from dinner celebrating my husband’s 50th birthday. The Sunsail Flotilla, the place, the weather, the people, the trip had all been exactly perfect. As I walked down the dock toward the restrooms for one last pit-stop before bed, with the moonlight offering up the boat reflections in the water, it spoke directly to me. I stopped in my tracks. How bold! At the same time, how brilliant. That little boat proudly announcing its name, I Love You, won me over in an instant. 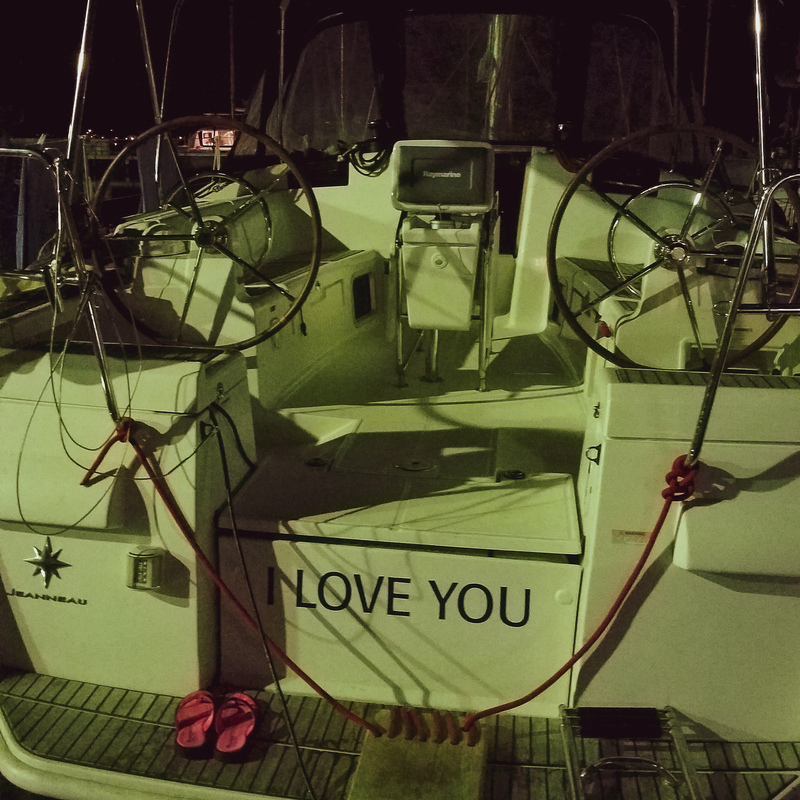 I could only imagine how delightful to get the VHF message “Agana Marina, Agana Marina, this is…I Love You”. In that circumstance, how could you not radio back “I love you too!”? I stopped and stared at that little boat for a while. I do love you, I thought. But it wasn’t just the little boat that was brave enough to wear its heart on its transom for all to see that I was enamored with. It was the whole thing. All of the boats quietly resting in the marina, the exhilarating sailing we’d experienced on the way in, spending time with my husband on his milestone day, and the opportunity for my husband to share the experience with his identical twin brother. I did love it. I didn’t grow up sailing, I grew up fishing. Beside and in rivers. That is what my father did and so as a child, that is what we did. Almost every vacation was hiking, camping, and fishing. When I was very little I would just run up the hill with the rod and line when I caught a fish rather than reel it in. Not the traditional technique, but it worked and from all reports, it was a crowd pleaser. I haven’t fished too much as an adult. My husband does, and he and my father go fly fishing on the rivers of North Carolina whenever we are in town. My dad has always been so strong, stronger than anyone really, but his back and knees are feeling the years. So, their long hikes breaking trail as they go to the very best spots are less frequent. I’d like to say that the trip sailing with my dad to the Bahamas was well planned. It wasn’t. My husband and I were originally going to sail with a friend, but those plans fell through last minute and we were left searching for a boat the week before our trip. Boat Affair came through for us, and connected us with Navtours, a terrific charter company out of the Palm Cay marina. I happened to be in North Carolina for the weekend when I learned that Navtours’ catamaran, Carpe Diem, would be available. That night at dinner I asked my dad if he could join us and he said he would think about it. Just like that, the plans were in motion. I was going to sail with my dad, and Charles and I would have an extra crew member for our first catamaran trip. What I hadn’t really considered until we were sailing toward the Exumas was the connection of the things we loved to do. My dad was excited to fish in the ocean, I was excited to share my new love of sailing with him. We fished, we sailed, we drank wine, we talked. We spent time together. Real time. All families are different. Mine is awesome. Mine is accommodating. Mine is easy. I am the one that left home for college and never returned. The one who for so many years spun a methodically scheduled, over-extended, work-forward existence. As an entrepreneur, I put work before everything. Before family. Before friends. Before myself. My incredibly adaptable family took this in stride, working with my sparse schedule on my too-busy terms. My mom frequently read us The Giving Tree by Shel Silverstein growing up. I’ve always been acutely aware that in that story my parents were the tree and I was the selfish boy. But I was too busy to understand the consequence of that role. Too selfish. That whirlwind existence is evolving. My job has changed shape, my relationship with my husband came into play, and my understanding of the things that are truly deserving of my time and attention has shifted radically. If you ask me what I love about sailing I could go on and on. I enjoy the mechanics of it, making it work, overcoming the challenges, doing things I never thought were in my wheelhouse. I love exploring new places, new countries, new cultures. I love the peace and quiet of the water. But more than all of this, I love the connection to the other people on the boat. There is literally nowhere I would rather be than on a boat with my husband. Every time we sail it is a chance to put life on pause for a moment to actually live life. Being on a boat with my dad was the same but with a bittersweet turn because I don’t know if or when it will happen again. When we were on that boat in the Bahamas, that is the longest stretch I’ve spent with my father in more than three decades. My mom will never be on a sailboat. Being on the water isn’t for her. Whenever I come to North Carolina, at least one evening of my trip is perched on the corner of her couch as we talk the night away. What books she is reading, where I am traveling, politics, religion, and other things you aren’t supposed to talk about. Hours pass, and we solve all of the world’s problems. My parents are healthy, I assume they will live forever exactly as they are. I know I am wrong. I look across at my mom during those conversations and want to stop time. So maybe what I love most about sailing is exactly what I love about my mom’s couch. Maybe it isn’t where you are, but who you are with. Maybe it isn’t what you are doing, but who you are doing it with. Sure, my fondness for marinas and sails and new places is stronger than ever, but maybe we can learn a lot from that little sloop in the Agana Marina. Love, not sailboats, makes the world go ‘round. This week is my dad’s 76th birthday. My mom’s birthday is just six days after that. A reminder that days pass. A reminder that whether we are on a boat, or on a river, or on the other side of the couch, every day has meaning that extends beyond what might seem urgently, though on reflection unimportantly, in front of us begging for attention. Lea Maxwell is the voice of escapeundersail.com, a web|blog project that connects new and future bareboat sailors with the resources, information, and motivation they need to competently and confidently sail beautiful destinations around the world. By profession, she is an executive working in the data and database marketing arena. By passion, she is a champion of finding and following individual purpose. What Yachting taught me about Life…..
How Do You Know If Your Goal is the Right Goal?